There were many mentions of “hatches” made in the narrative. One “Port hatch” specifically. Nemo references multiple “hatches” on various occasions. 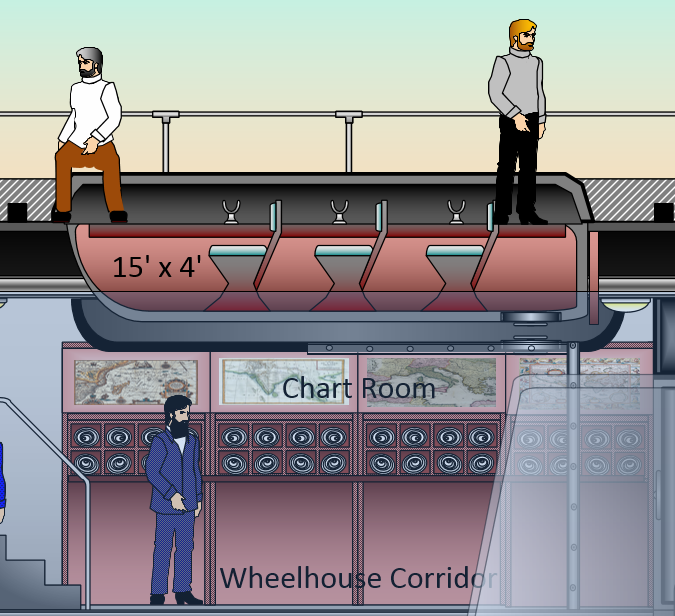 I placed a Forward Hatch just in front of the wheelhouse in lieu of a better location even though Verne made no mention of a ‘forward hatch’ specifically. Maybe that’s why Harper Goff put one there as well for the Disney film. I made this hatch as flat, inconspicuous and coincident with the deck plates as possible. I believe this particular hatch would have the release wheel somewhat recessed, again to help make it flush, not extended and interfere with any obstacles… such as a vessel being rammed. 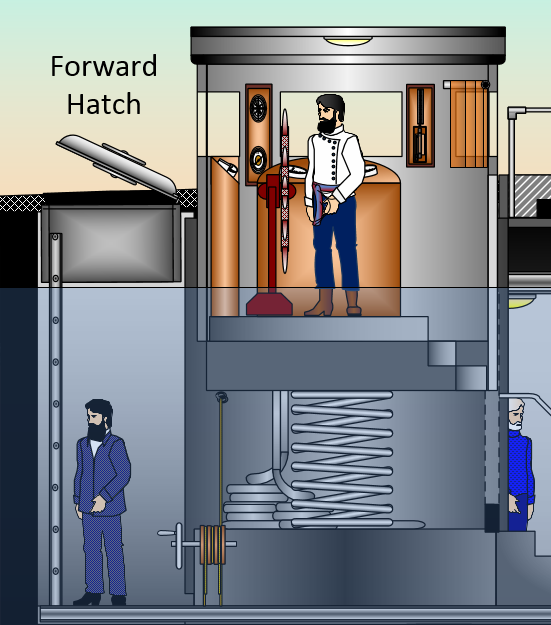 I included the hatch to the dinghy compartment and, placed one in the dinghy itself, as Verne described; “double hatches” to enter the dinghy. 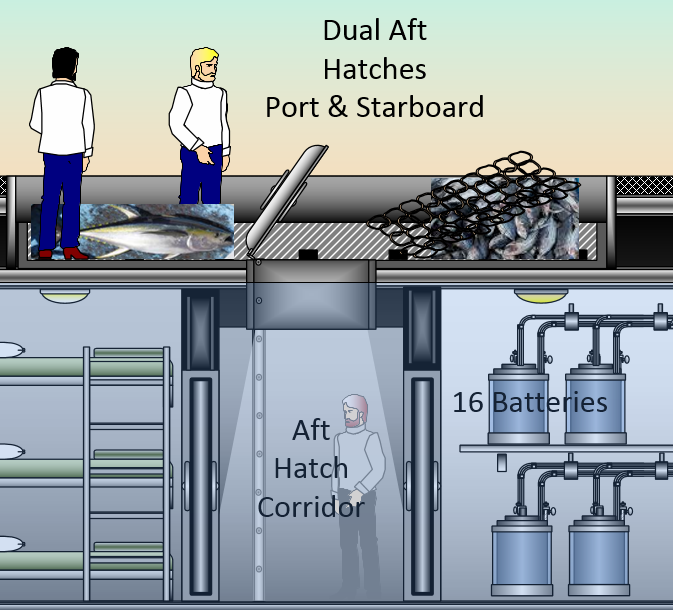 But, just including the forward hatch in front of the Wheelhouse didn’t resolve all the “hatches” references. I placed Two Aft Hatches centered, in their own Aft Platform, well back of the Searchlight Cage and made extensive explanatory comments in the “Platforms” section. I added a ladder fitted to the inside of the doorway, then added a handrail that fits through the portal and can be folded out of the way against the hull when closed. 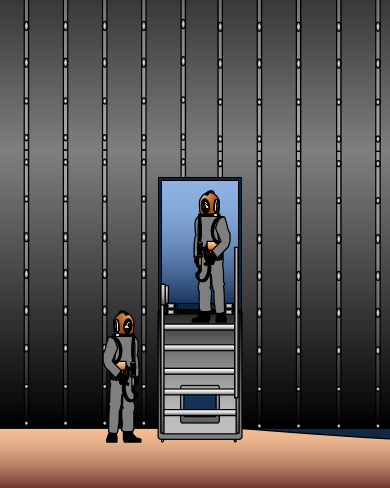 Many of the other designers have the Diving hatch pivoting on its top hinges. 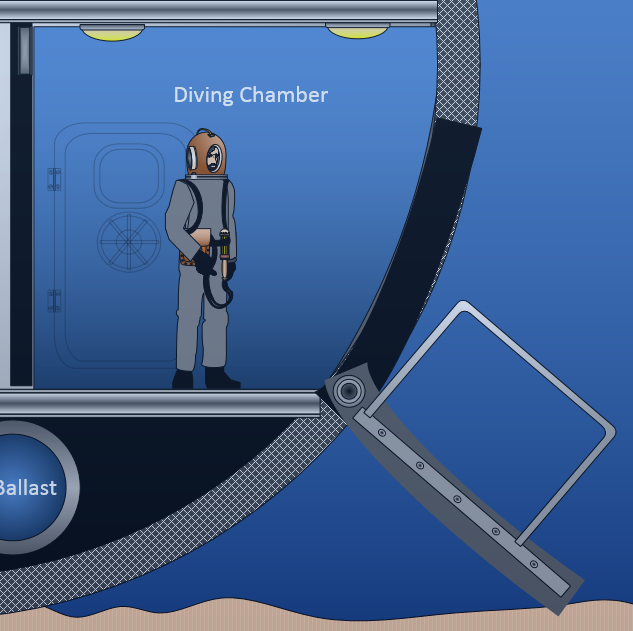 This would allow no easy egress from the chamber to the sea floor, which may be many feet below the chamber floor or the hatch, and re-entering the boat might be problematic as well. Pivoting on its bottom hinges provides a ramp, or even possibly steps as in my case, for easily reaching the seabed and returning inside. Although never addressed directly by Verne in the text, I think all these hatches can be easily justified. squid, would be more readily handy. To descend all the way down to the Prep Room for the hatchets and/or harpoons when the need is on deck, would be impractical in the extreme. But there’s no reason some weapons couldn’t also be retained in the Diving Prep Room. 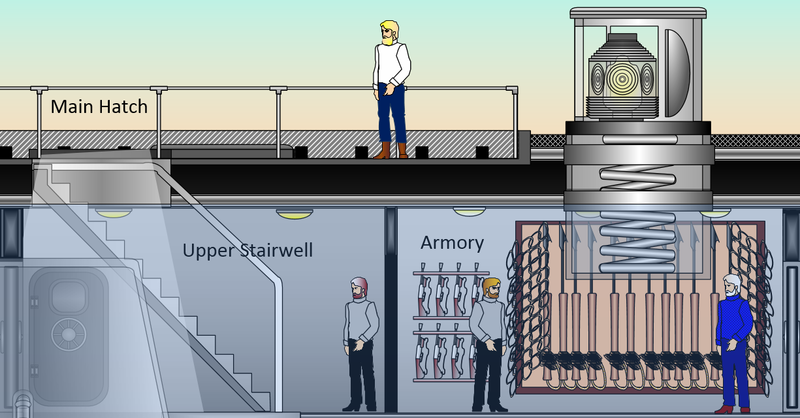 I originally had the Armory in the forward corridor just aft of the Wheelhouse and the Chart Room on the upper deck just aft of the Central Staircase. But I reverses these to make the charts more accessible to the Helmsman, Captain or other crew needing them near the Wheelhouse. This also placed the Armory nearer the wide opening at the Central Staircase and the Main Hatch, but could also quickly reach the two Aft Hatches if necessary. Again trying to stay with Verne’s practicality and Nemo’s simplicity. Hello! I found your blog today when I was researching facts about Jules Verne’s life. Jules Verne was a Visionary. Like many children, I enjoyed the Walt Disney ride, “20,000 leagues Under the Sea,” and thought about Harper Goff’s design of the Nautilus. The darkness of the ride and the ominous presence of the giant squid stuck with me. There might have been some sonar pings as well. Unfortunately the ride closed in 1994. Perhaps your published designs could inspire Disney’s Imagineers to bring this ride back, but with your design contributions! I would love to walk through these designs in 3D. Thank you for sharing your ideas, designs and for your service in the Air Force! I also am a big fan of Harper Goff’s design. In fact since 1954 when the film came out. I worked on my 2-D design from the text of the book and all historical references to his times from 1997 to 2015. I hope one day soon to get help transferring my 2-D to a 3-D model which will allow you your walk through. I’d love to see that myself. Thanks again for your comments and I hope Disney will take the hint.